Aquaman is plotting a bold new direction with Kelly Sue DeConnick on board, and so far it's smooth sailing. 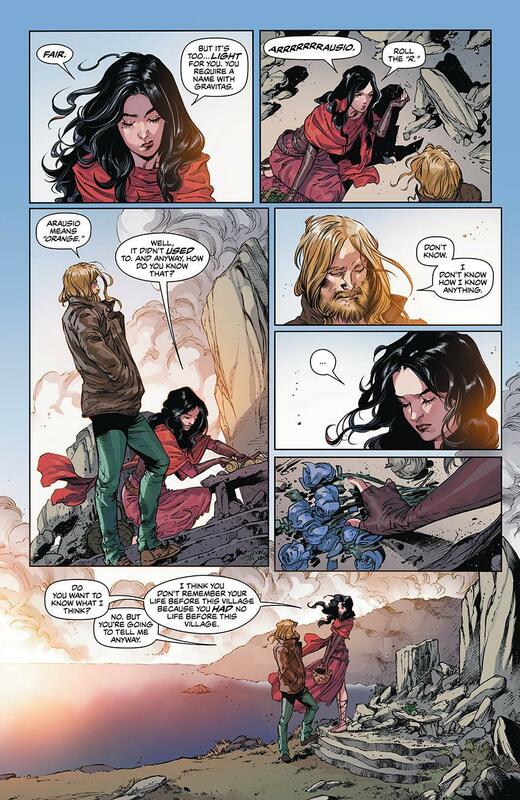 Spoilers incoming for Aquaman #43, so if you haven't read the issue yet you've been warned. Out of the wreckage of "Drowned Earth" comes a story that seeks to take Aquaman further out of his comfort zone, but not in a way that necessarily takes him out of his element. 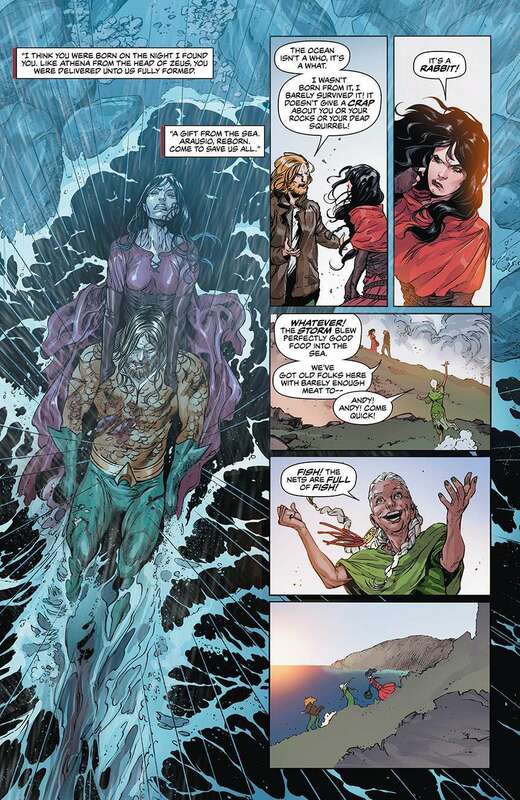 Writer Kelly Sue DeConnick and artist Robson Rocha seem to be more focused on expanding the role that water itself plays in Aquaman's mythos, essentially making the power he holds more of a character than in times past. That characterization is framed within an equally compelling mystery regarding the island he now calls home, or to be more precise the village of unspoken water. At first, it seems as if this is going to be a story of amnesia and recovered memories, but thankfully that beat gets turned on its head a bit by issue's end. In fact, it crescendos nicely into Aquaman's main quest in this mysterious place, which is to become the ocean's champion. That might sound a bit grand, but luckily there's a very personal tale that grounds it. That is actually one of the issue's biggest strengths, as everything by issue's end seems to have a purpose. Nothing feels forced or abstract for the sake of complicating a simple plot. Arthur has a quest by the book's conclusion and while you still have questions they aren't regarding the basic premise. That goes a long way in keeping you invested in these new characters that Arthur finds himself around these days, and that foundation will be quite important in future issues. 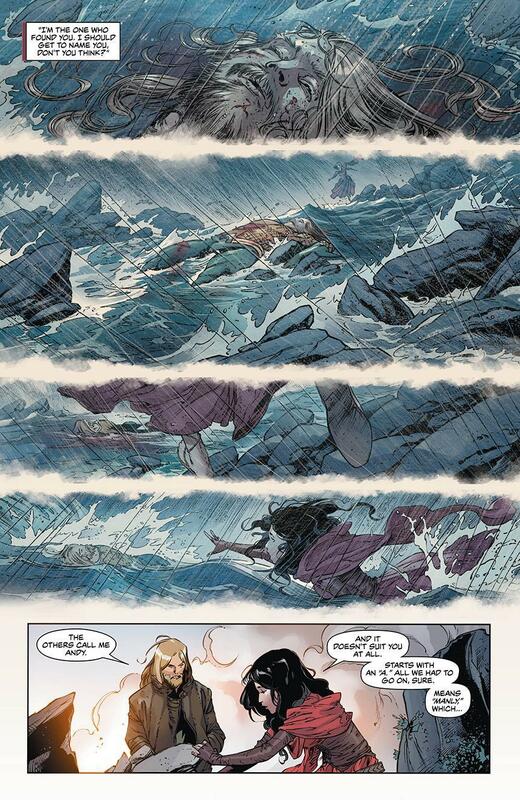 Visually the book is stunning at times, with the picturesque surroundings sweeping you off into another world. This place feels truly separated from the Atlantis and surface wars that Aquaman is used to, and that's refreshing. Rocha brings an endearing charm to this village, but there's also an odd sense of tension and dread that accompanies it. That's in part due to how the panels alternate between the quirky citizens and Caille, but it's the moody visuals that really take it home. Speaking of Caille, she's one of the bright spots of the book, despite not having a myriad of dialogue in the first issue. Her verbal sparring with Arthur (or Arausio as she calls him) is different than the dynamic he has with Mera, and it's interesting to see Arthur the more cynical one of the pair, something that the character isn't often known for. We're happy to see a new side of Arthur, and so far it feels like an organic journey that could ultimately lead to fleshing out the character in a whole new way. Aquaman has always been tied to the ocean, but DeConnick starts to frame it much like a character as opposed to a power to be wielded, and there's some amazing potential in that premise. This is the dawn of a new era for Aquaman, and we've never been more excited about what the future holds.